Although my style isn't quite as whimsical as it used to be ModCloth still has a great amount of timeless options that appeal to where I'm at in my life and style wise right now. I never really fell for the off the shoulder look but this Donna Morgan, Make You Mine Midi Dress from ModCloth changed my mind. It seemed effortless and the material of the dress is great (cotton & spandex). I've been looking for a new summer dress and this is it! This dress wears super comfortably in the 100° degree Kansas City heat. I am wearing a size 0 in these photos for reference. I know finding the right item in the right size can be a frustrating process but ModCloth makes it easy. The ModStylists (in-house stylists) can help you find the perfect size. ModCloth also makes it easy to find your fit by using their mobile app to recommend items based on your size from previous purchases. I think handbags are my accessory addiction. I found this vintage Toni Palm Bergdorf Goodman handbag for $25 on eBay and it makes me so happy. It surprisingly holds a lot- my iPhone, lipstick, sunglasses. Oh it's just my favorite thing right now. Im also loving this simple, Bolder the Better ring it's an accessory that can be worn for any occasion. I always wear a Kate Spade Swan ring, but sometimes I'll take some time off from wearing it, and put this gem on instead. So friends, check out the fun happenings at ModCloth! Let's build each other up! Let's support companies that truly reflect what it means to be an American Woman or even better a Nasty Woman. I received these products complimentary from ModCloth for testing purposes. All opinions are always my own. The only time I read about ModCloth is through a vintage outfit blogger! That said, the dress you're wearing is gorgeous! 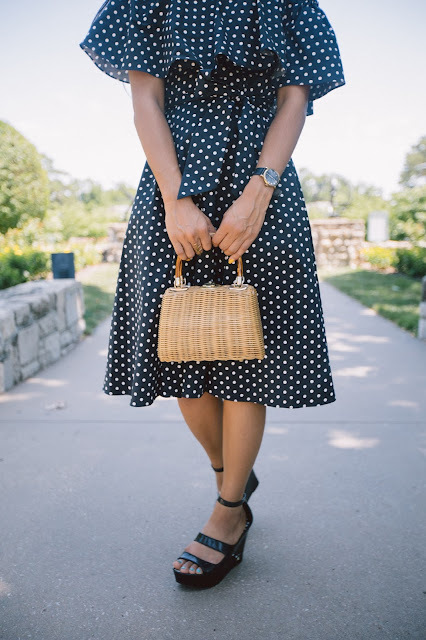 This polka dot dress is perfect on you! So pretty! These polka dots are so cute! Love the outfit! 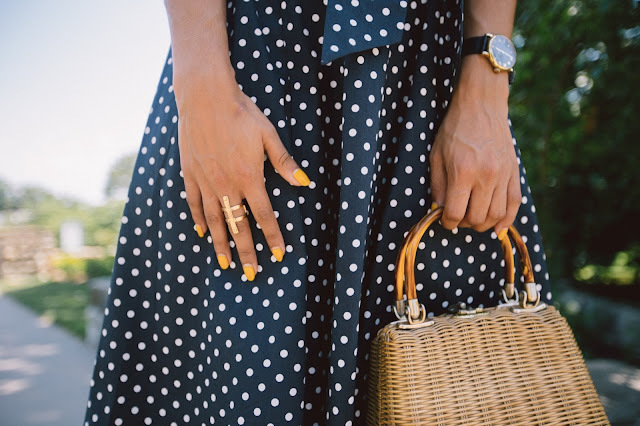 Love this polka dot dress! So chic! Beautiful dress <3 I love how you accessorized it! Awh thanks so much Maayuk! Looking so lovely in this dress! Have a lovely week. Thanks so much Gemma, you too! That is a great dress, it's so classic but the off-the-shoulder style makes it really fun. I love your yellow nails too! I'm glad we're getting a little break from the heat at least :) Have a good week! Thanks Mme! I am too but I'm in D.C. for the week so I'm missing it! When I took these photos it was almost a hundred degrees. 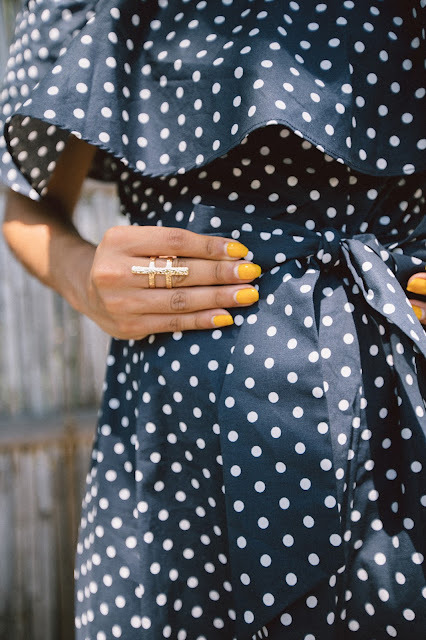 Yellow nail polish is a must for the summer for me, I have green on right now. I'm loving the retro vibes of this outfit! Reminds me of a different era. Definitely a cute dress! Awh thanks Jeanne, sometimes that's what I'm going for. 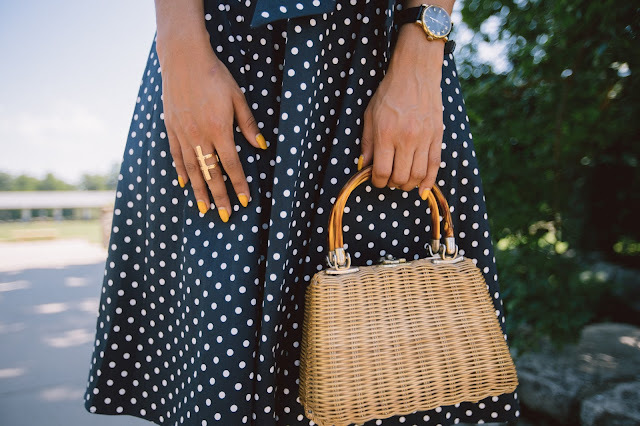 These polka dots are perfect, lady! Love you in this dress! This dress is so cute for the summertime! 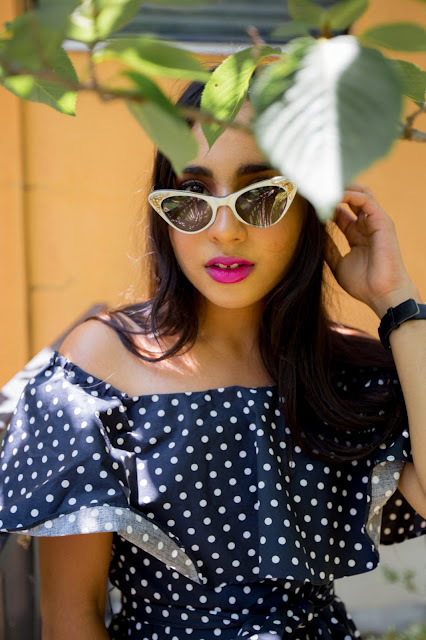 Loving the polka dots and off-shoulder detail. It pops so nicely against the orange background too! Thanks Christina, my photographer really insisted on it and I'm so glad she did. The dress is pretty and you look so lovely in it. Love the big ruffle detail! Thanks Naya, a statement ring is a must! Love this dress on you. I haven't bought into the off the shoulder trend yet but this dress is beautiful. Thanks so much Paula. I really didn't either but the material and quality of this dress was so hard to pass up. The off the shoulder seemed like it was meant to with this style- for me personally! Here's to searching! Pretty dress! 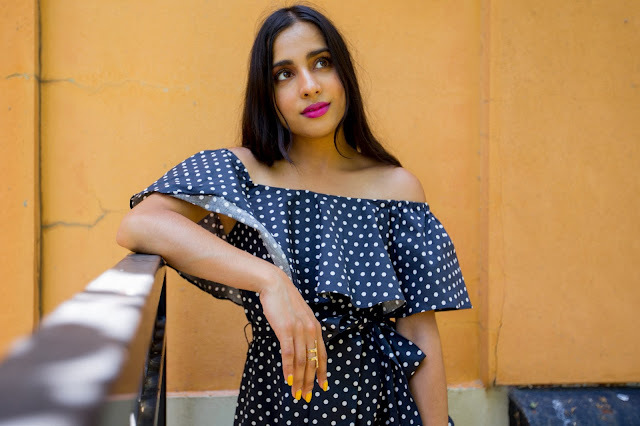 I love the polka dots, flouncy ruffly design just off the shoulder and the bow at the waist of the Make You Mine Midi Dress. It's also nice to know ModCloth supports diversity. You chose and applied a gorgeous shade of lipstick beautifully!